Employs a different color for each of the city's cadastrals. Neuer Orientirungs-Plan von Wien mit allen Strassenbenennungen. 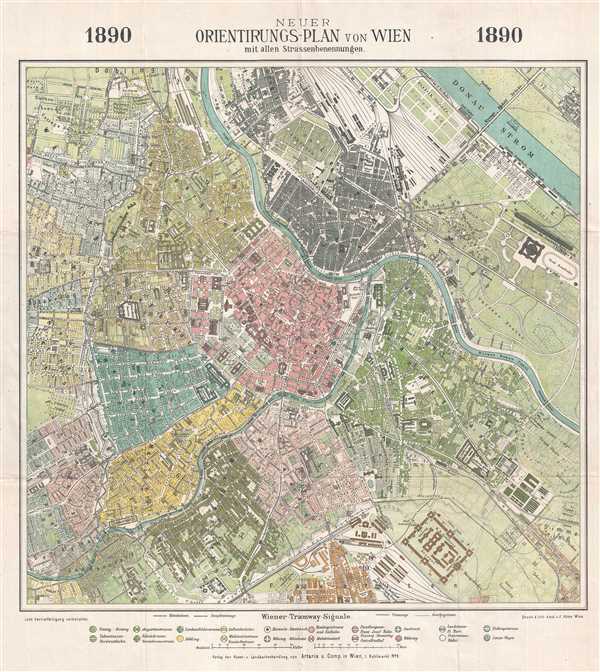 This is an 1890 F. Köke city map or plan of Vienna, Austria. The map depicts the city from Währing and Neulerchenfeld to Leopoldstadt and Simmering and from Brigittenau to Favoriten. Each of the different cadastrals are numbered, labeled, and colored differently for easy differentiation. Individual buildings are illustrated and several of the important locations throughout the city are labeled. Numerous streets are labeled, along with rail lines, bidges, and squares. The Danube River is situated in the upper right corner, with the Viennese Danube Canal cutting through town. An index of tramway signals is situated along the bottom border, indicating the line on which the tramway operates. This map was produced by F. Köke in 1890. Very good. Light wear along original fold lines. Attached to original binder. Blank on verso.